Camera: I am assuming you own a DSLR on which you can set a high ISO (800 or higher) and that can take long exposures, say, up to 30 seconds. My instructions are directed primarily to the current (2005) Canon DSLRs. The amateur ones have ISO settings up to 3200 and can take 30 second exposures without any accessories. Nevertheless you can probably have equal success with any current DSLR that has an ISO setting of at least 800 and is capable of 10+ second exposures. Older DSLRs (like the Canon D30) were too noisy even in 15 second exposures. Lens: Forget that telescope! You do NOT need a long focal length. Yes, you can take great astrophotos with a 14mm lens or even a fisheye. As you work your way up with longer focal lengths you'll quickly realise that a focal length of 1000+mm is really not for a beginner. You do need a sharp, fast lens, wide-angle. However, preferably a non-zoom. You do not have one? Just purchase a cheap 50mm from your camera manufacturer. The Canon EF 50mm/1.8 II is a fantastic bargain @ around $70. I like to call it the Mighty 50/1.8 :-) It will also serve as a great portrait lens on the 1.6x crop DSLRs. You can also use it for macros, panoramas and even shoot galaxies (tongue-in-cheek) http://samirkharusi.net/mighty_50.html Anyway, you need a lens that gives reasonable stars at f2.8. The Mighty 50/1.8 will do that well enough for your first efforts. As your expertise ramps up you may prefer to close it down to f4. Tracking Mount: Forget about that one too! Most people's initial purchases of astro mounts are OK for visual observations, but awefully inadequate for astrophotography. So, rather than complicate life, just place the camera on the ground! 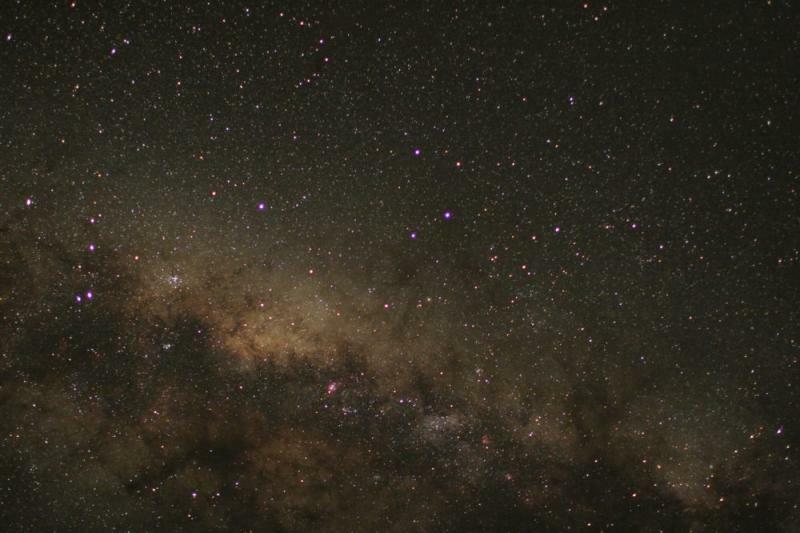 Point it at the brightest patch you have, eg the Sagittarius Milky Way or Orion. Shoot off 10 to 20 frames for later stacking. You will note immediately that the wider the lens you use, the longer the exposure you can use. At this stage do not bother with in-camera noise reduction or even taking dark frames and flats. That can all come later, after you get the hang of processing your images.